I love when people say that gun control is a bad idea because it wouldn’t stop mass murders. I forgot that we can only pass laws if they’re one hundred per cent effective all the time. It might stop SOME mass murders if we made guns a little harder to obtain, no? I guess the subject of guns is weird for me because I don’t really understand the appeal. But then, I don’t understand the appeal of sports in general, and hunting and shooting targets are forms of sport. I can’t say I’m against well-regulated hunting, which certainly serves more of a useful purpose than, say, football. I’m sure most gun owners are responsible, and I can understand the desire to protect your household, but it just seems like guns could easily do more harm than good. One issue I think about is that of depression, and how simple it would be to commit suicide if you had a gun on hand. It’s not like only severely mentally ill people ever consider killing themselves, whatever the popular opinion might be. It takes a lot more work to hang yourself or jump off the overpass, and that means more of a chance to reconsider. I get the impression that many people view guns like security blankets, more something that creates a comfortable illusion of safety than anything that would really help in a practical situation. I keep hearing that we need more sane people with guns to stand guard against the insane ones, but unfortunately the world isn’t neatly divided into the crazy and the normal. People who seem perfectly sane can occasionally snap, and those with known mental illnesses are often of no danger to anyone. I think guns being so common can increase the chances of violence even when the people involved are nice and well-trained. There’s obviously no way to totally prevent people from obtaining guns illegally, but not all guns used in crimes are illegally obtained. One argument I always hear in favor of carrying guns in public places is that, if somebody comes in to rob the place, the gun-toting customers can stop that person. I’m not saying it’s not possible, just that I think it’s a little odd to leave security in the hands of random customers. And no, you’re probably not being to able to use your gun to prevent tyranny. In case you didn’t realize it, the government has tanks now. The Founding Fathers had some great ideas, but they were by no means clairvoyant. 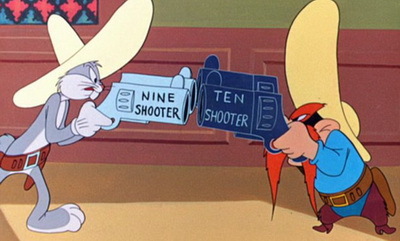 It seems that gun obsession is considered a largely American trait these days, to the point where people in other nations basically think we’re a country of Yosemite Sam. It’s kind of weird that the NRA is completely allied to the Republican Party when there are plenty of gun-lovers who are on completely different parts of the political spectrum. I’m not entirely sure how the association began, but it does seem like Republicans are eager to use violence as the first option. I guess it goes along with being in favor of war and the death penalty, although I’m not entirely certain how many of the same people are virulently anti-abortion. Maybe it’s because fewer babies being born means less cannon fodder. It probably has something to do with the two-party system as well, and how issues that don’t directly relate to right- or left-wing viewpoints have become connected to them. It’s like how the Republicans have become the party of global warming denial, even though you’d think conservatism and conservation would go hand in hand, at least based on the words. Then there’s the combination of guns and religion, even though you’d think having God on your side would mean you wouldn’t need a weapon. Really, the incredible fragility of life is one of many reasons I can’t accept the idea that we were intelligently designed. I’d think an all-knowing being would have used tougher material. Of course, despite the constant insistence that Obama is coming to take your guns (what do you think he’s going to DO with all of them? ), the Democrats haven’t been making much of an effort to curtail gun violence either. When it comes down to it, I’m not opposed to guns per se so much as I am the cheapness of life. There’s not too much we can do about that on a grand scale, but we can certainly make more of an effort to prevent unnecessary violence, right? This entry was posted in Health, Politics, Religion and tagged gun control, guns, hunting, mental health, national rifle association, violence. Bookmark the permalink. 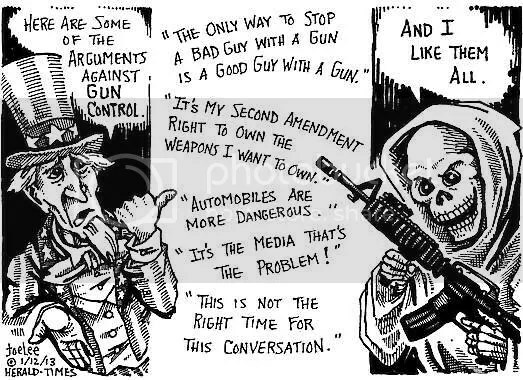 As a hippie peacenik married to a gun nut, I feel I’ve got a pretty good view of “both” sides of the issue, and the fact that there ARE two extreme sides is probably the most frustrating thing about it. Well, that the sides are extreme, that is. Because if anyone should suggest a moderate compromising solution, ie a GOOD solution, it gets immediately shut down. Every time I’ve got to renew the guy’s NRA membership I just groan, ugh, THEM? They need more of your money to keep spreading their agenda of panic? (Then there’s the lesser-known Gun Owners of America, which J claims is even MORE extreme in their politics. I’m not even sure I want to know. Actually, I think THEY may be the ones responsible for the “MORE GUNS MEANS LESS CRIME” rhetoric). If only they would STOP panicking long enough to accept that regulation is not the same as banning, but they just start screaming “SLIPPERY SLOPE! SLIPPERY SLOPE!” I think people should be required to test for licenses the way they are in order to drive a car, but if you suggest that the NRA starts comparing it to, like, Mutant Registration, or for the less-geeky among them the registration of minorities by tyrannies. BUT HOW IS HAVING A DRIVER’S LICENSE LIKE THAT. You have to earn the right to handle a potentially deadly machine, and then you have proof that you’ve earned that right. It’s not the same as being registered just for BEING. *J likens it to wearing a seat belt, himself. I can’t really buy the slippery slope argument when we have the Second Amendment, and no politicians appear to support a gun ban. 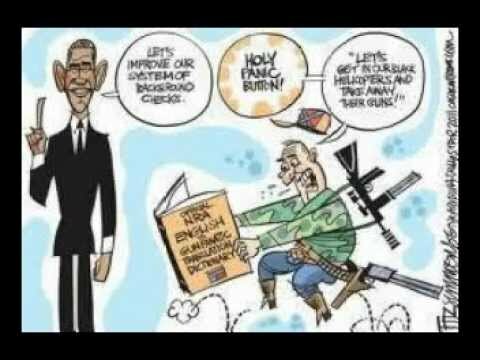 Obama certainly doesn’t, yet somehow gun owners have made him into a gun-stealing boogeyman. Also, I kind of wonder why the National RIFLE Association is advocating for private ownership of semi-automatic weapons. Then again, a lot of organizations are stuck with outdated names. Just ask the NAACP. Hey, people on both sides are yelling on social media again and it just reminded me of commenting on this post. Because on social media there’s no point saying anything, it’s always on the defensive, either defending gun owners to GunsREvil folks or defending security-tightening to the SlipperySlope folks. And I remembered writing this comment, and what struck me about the memory was that I actually wrote MY thoughts on the subject. I wasn’t defending any position in relation to anybody else, and trying to tread lightly, I just called it like I saw it and felt totally safe to do so. Which brings me to my point: THANK YOU for hosting this blog as a safe space for people to argue and disagree politely, where people feel SAFE to post their true opinions and know that those opinions will be respected, not demanding that they hold to any agenda or whatnot.